I have wanted to create a vintage flight attendant uniform using airline garbage for many years, so this commission from Delta Air Lines was a dream come true! 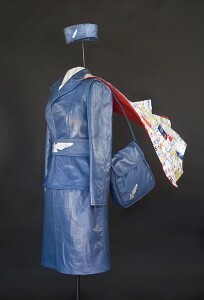 The uniform, hat and purse are sewn from worn-out leather seat covers from Delta planes. The cape is made from replaced safety cards, Sky Magazines, old plane tickets, and pretzel wrappers all cut into strips and sewn onto worn pillow cases. The cape was then lined with a discarded Delta blanket. 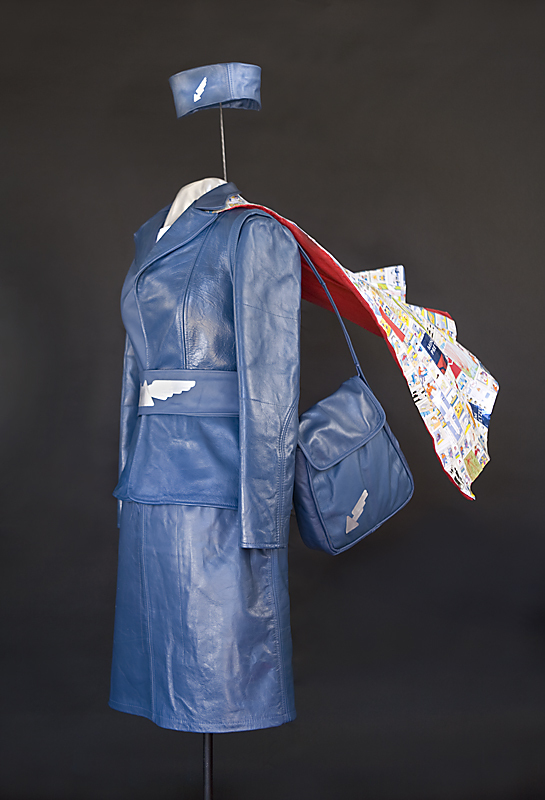 Both the cape and purse appear to fly in the wind thanks to armatures created from metal wire used for yard signs during the last presidential election. And the final touches? To create the vintage Delta symbol on the purse, hat and belt I used recycled aluminum cans. The garment was created to showcase Delta’s numerous sustainability programs that range from in-flight recycling to numerous fuel and CO2 conservation initiatives. For details, read the full 2009 DELTA Corporate Responsibility Report. After the commission began, staff from Delta mailed many boxes of waste materials to my studio in Santa Fe, and I received old photos of stewardess uniforms from the 1940s and 1950s sent to me by employees at the Delta Heritage Museum. After hours of carefully washing who-knows-what-off the old leather seat covers, they were cut, sewn and transformed into the coat and skirt using a vintage pattern from the 1940s. Matthew Mahler of Tierra Ideas designed and made the purse. Matthew works regularly with Delta Air Lines creating wonderful bags out of recycled aircraft seat covers provided by Delta. See his whole line of recycled bags and totes atwww.tierraideas.com. One morning as I began to put all the design concepts together I woke up at 2:00 AM and realized that the Environmental Steward-ess needed to be a super-hero! I began researching female super heroes from the 1940s for the design of the cape and I was interested to learn that Wonder Woman was actually created in 1941 by a psychologist to inspire girls to stand up for themselves. In addition to being incredibly strong, she had bulletproof bracelets, a lasso of truth that made men be honest, and most relevant to this project, an Invisible Plane! Working on the cape was an interesting experience because the safety cards are quite macabre. Cutting out pictures of people preparing for a crash, evacuating a plane and floating on life rafts is pretty morose. In fact one of my collaborators who helped to cut the safety cards is afraid of flying and joked about taking an anti-depressant before working on the project! In contrast to the morbid content, these tragic scenes are depicted in colorful cartoons, so from afar the cape looks quite whimsical and cheerful. I really enjoy this contrast. It felt to me in the end that the cartoon feeling of the cape compliments the comic strip super-hero aspect of the garment! 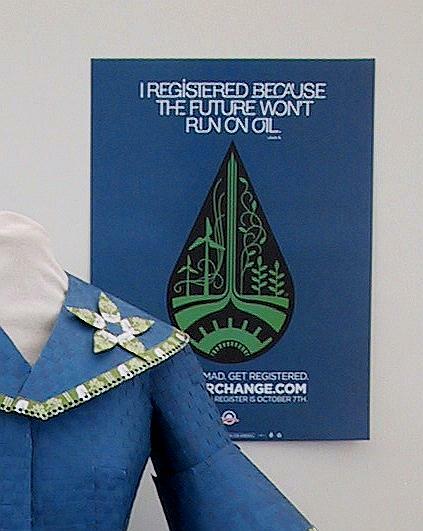 The Environmental Steward-ess will join 18 of my other eco-chic pieces in a yearlong exhibition in the Atlanta International Airport. 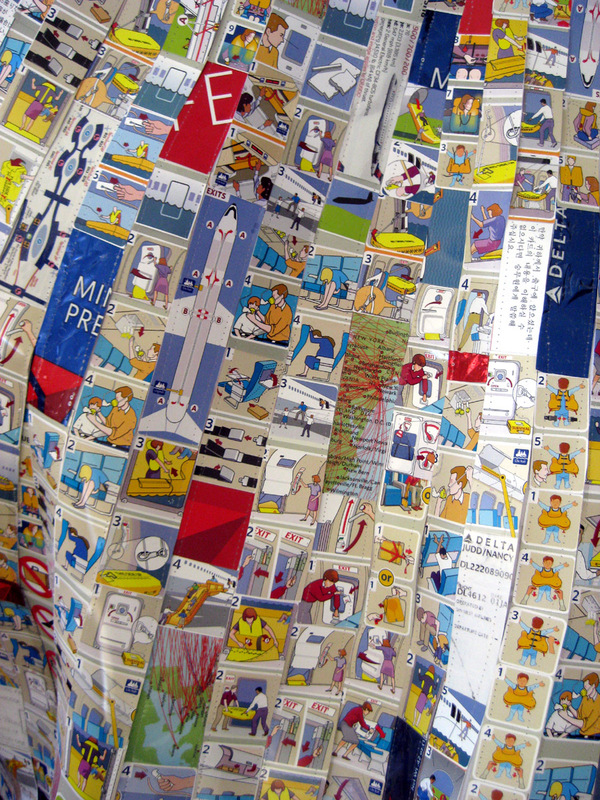 The show will be on display on April 18th in nine cases located throughout International Concourse E.
Thank you to all of the people* who helped to construct the Environmental Steward-ess, and to Delta Air Lines for commissioning this piece, it has been one of the most engaging and fun garments that I have created thus far! *My collaborators on this project were Frank Wrenn, Jennifer Otenti, and Judy Ondrey from Delta Air Lines, Matt Mahler from Tierra Ideas, Dawn and Jeremy Richards from Bacon-Richards Fashion Design Studio, Dan Radven, Nicole Morris, Susan Todd and Ariel Harrison. Thanks everyone! You are such a stud Nancy. So glad we have kept in touch! Lately I have been wondering if you or someone has developed any ideas for recycle-made clothing that is durable and washable enough to be sold on a large scale. It is something I would be very interested being a part of – design, development, production – if such a project seems feasible. I am looking for a new direction in a business start up. I want to do something that doesn’t a lot of driving and gas powered equipment as I have now with the landscape biz. Please let me know what you think.